Most member states of the United Nations still refuse to recognize Jerusalem as the united capital of Israel, even though more than 50 years have passed since the city’s unification in 1967. The United Nations and its member states do not recognize the legality of Israeli sovereignty over Jerusalem for political and religious reasons. They drape their opposition in claims of Israel’s disregard for international law. They claim that Israel’s capture of Jerusalem during a war, when it was taken from Jordan by force, is a violation of the international law forbidding annexation of foreign territory. For that reason they insist that Israel’s rule over Jerusalem is illegal. This monograph, however, shows that Israel has valid legal status in Jerusalem. Israel gained control of both parts of the city after Jordan and other Arab states declared war upon it in May 1948 and in June 1967 respectively. In doing so, Israel exercised its right to self-defense, which international law recognizes as a legitimate reason for using military force. Moreover, apart from Pakistan, not a single country in the world (including any of the Arab states) recognized the legality of Jordan’s sovereignty over east Jerusalem. In fact, this rationale led to the recent dramatic developments in the attitude of other countries regarding Jerusalem’s status. In April 2017, Russia recognized west Jerusalem as the capital of Israel and east Jerusalem as the capital of a future Palestinian state. In December 2017, the United States recognized Jerusalem as Israel’s capital. In February 2018, the United States announced that its embassy would be transferred from Tel Aviv to Jerusalem in May 2018. Subsequently, Czech Republic and Guatemala anounced their recognition of Jerusalem as Israel’s captial. Other countries are considering taking similar steps in the future. Due to the great sanctity that Judaism, Christianity, and Islam attribute to Jerusalem, this city has been at the center of the Arab-Israeli conflict for the past 100 years. Jerusalem is sacred to Judaism by virtue of the Temple Mount, which was the site of the three Jewish Temples: the First Temple, built by King Solomon, was dedicated in 960 BCE, and destroyed by the Babylonians in 586 BCE. The Second Temple, built by Jewish exiles returning to Jerusalem from Babylonia, was dedicated in 516 BCE. In the year 20 BCE, King Herod persuaded the Jews to allow him to demolish the Second Temple, which was small and modest, in order to replace it with a large and impressive structure. The Jews agreed; King Herod destroyed the Second Temple, and within one and a half years constructed in its place the largest and most beautiful temple in the world – which was dedicated in 19 BCE.2 This was the Third Temple, destroyed by the Romans during the great Jewish revolt in 70 CE. For Jews, this is the holiest place in the world, since the Divine Presence (Shechinah) rests there forever. According to Jewish tradition, the great stone, now in the Dome of the Rock, was under the “Holy of Holies” in the Jewish Temple. According to the Midrash (Rabbinic literature), this stone was the starting point of Creation. Since God founded the world on this stone, it became known in the Midrash as the “Foundation Stone.” The stone is also considered to be the center of the world. According to Jewish tradition, the Temple Mount is also Mount Moriah, the site of Abraham’s binding of Isaac on the rock. Jerusalem was the capital of the Kingdom of Israel (during the reigns of King David and King Solomon in 1004 BCE–928 BCE), the capital of the Kingdom of Judah (928-586 BCE), and the capital of the Hasmonean Kingdom (167-63 BCE). Jerusalem was the capital of the Jewish people 1,000 years before it became sacred to Christianity and about 1,700 years before it became sacred to Islam. According to the Bible and the Jewish faith, Jerusalem is the city of choice, where the God of Israel chose to dwell forever on the Temple Mount. Jerusalem is mentioned 656 times in the Bible (and not even once in the Koran!). The Torah requires every Jew to make a pilgrimage to Jerusalem three times a year (on the festivals of Passover, Shavuot, and Sukkot). There is no such commandment in Christianity and Islam. Due to this background, Jerusalem has always been the most important city for the Jewish people, nationally, religiously, and historically. It was against this background that after being exiled from the Land of Israel by the Babylonians (586 BCE), Jews throughout the world vowed to remember Jerusalem forever until they returned to its holy precincts: “If I forget thee, O Jerusalem, let my right hand forget her cunning…” (Psalms, 137: 5-6). Accordingly, Jews throughout the world yearned for 2,000 years to return to it: “Next year in rebuilt Jerusalem” (in the prayers of the Day of Atonement and at the end of the Passover Seder). In light of its holiness, Jews face the Temple Mount when praying in synagogues everywhere, including in Jerusalem: “Return in mercy to Jerusalem Thine city and dwell there as Thy have promised; speedily establish therein the throne of David Thy servant, and rebuild it, soon in our days, as an everlasting edifice,” (the Amidah prayer, recited three times each day). For Muslims too, Jerusalem is holy because of the Temple Mount, which they call the “Haram al-Sharif” – the “Noble Sanctuary.” For Muslims, the holiness of the Temple Mount originates from their belief that the Prophet Muhammad rose to heaven from the rock on the Temple Mount (the “Holy of Holies” in the Jewish Temple), met with Allah, and received the commandment to perform five prayers a day, and thereafter returned to Mecca. Muslims also believe that this is the center of the world, the starting point of Creation, and the place of binding. However, according to Muslim tradition, it was not Isaac but Ishmael who was to be sacrificed by Abraham/Ibrahim. To commemorate the Prophet Muhammad’s ascent to heaven from the rock, as mentioned, they built the Dome of the Rock above this rock and inaugurated it in 691 CE. This structure was not built as a mosque and was never designed for public prayer. Indeed, the building only became a women’s mosque in May 1952, and since then, women have prayed there every Friday. The Muslims have built five mosques on the Temple Mount: the Dome of the Rock (691 CE), which has been used for the past 30 years as a women’s mosque, the al-Aqsa Mosque (705 CE), the Al-Buraq Mosque (early twentieth century), the al-Aqsa al-Qadim Mosque (August 1989), and the Marwani Mosque (“Solomon’s Stables”) (December 1996). Due to this background, the Temple Mount/Haram al-Sharif is also sacred to Muslims, and for them, this is the third holiest site in the world, after the Holy Kaaba Mosque in Mecca and the Tomb of the Prophet Muhammad in Medina, Saudi Arabia. Therefore, everywhere, even in Jerusalem, Muslims pray with their faces turned toward Mecca. For Palestinians, the Haram al-Sharif is also a national symbol. Its presence in east Jerusalem is the origin of their demand for the division of the city and the establishment of east Jerusalem as the capital of any future Palestinian state. This is the main reason for the refusal of the Palestinians, the Arab states, and other countries that support them to recognize the legality of the unification of Jerusalem by Israel and the legality of its sovereignty in east Jerusalem. They view this part of the city as “occupied territory,” which in the future should be placed under their sovereignty as their capital city. Jerusalem and the Temple Mount are also holy to Christianity, primarily because of events in the life of Jesus, which took place in the city. Jesus taught his disciples on the Mount of Olives, and there he prophesied the destruction of Jerusalem. On the Temple Mount, he was apprehended and handed over to the Romans for heresy and attempted rebellion. He was tried and convicted at the Antonia Fortress, near the Temple Mount, and from there he was led along the “Via Dolorosa” to the place of his crucifixion and burial, where the Church of the Holy Sepulcher, the holiest place in the Christian world, was subsequently established. There, he was resurrected on the day following his burial, lived for two weeks, and ascended to heaven from the heights of the Mount of Olives. On Mount Zion, one may find the Cenacle (dining room) – the place of Jesus’ Last Supper (Passover Seder) – from which the Twelve Apostles set out to spread the message of Christianity to the world. Despite this, the Christian countries, headed by the Vatican, have no political interest in Jerusalem and the Temple Mount and would have been satisfied with special status being accorded to the Holy Places, safeguarded by international guarantees. However, due to the economic and political ties of various countries with the Arab states, and their concern for the fate of the Christian communities in the Palestinian Authority and the Arab states, they too do not recognize the legality of Israel’s rule in east Jerusalem and the unification of the two parts of the city. With the conquest or liberation of east Jerusalem by Israel in the Six-Day War in June 1967, the Christian and Muslim worlds were shaken both theologically and politically by the imposition of Jewish-Israeli rule over the most sacred places of Christianity and Islam in Jerusalem, particularly the Temple Mount/Haram al-Sharif (the third holiest site in the Muslim world), the Church of the Holy Sepulcher (the holiest site in the Christian world), and more. Consequently, the struggle for the political future of Jerusalem was renewed. To strengthen Jerusalem from a security, economic, and demographic standpoint, Israel expanded the area of west Jerusalem (38 square kilometers) by incorporating Jordanian Jerusalem (6 square kilometers) and the lands of 28 villages and towns (64.5 square kilometers) in the West Bank of the Jordan River (Judea and Samaria). It also built 13 new Jewish neighborhoods there, applied its jurisdiction, administration, and laws to all of these territories, and called them “east Jerusalem.” The entire extended city was recognized in Basic Law: Jerusalem, Capital of Israel, 5740-1980 as the complete capital of Israel. In November 2000, this law was amended by the insertion of Section 5, which states, for the first time, that the territory of Jerusalem also includes all the areas that were incorporated into its jurisdiction at the end of June 1967. Section 6 was also inserted, stating that no authority within the jurisdiction of Jerusalem could be transferred “to a foreign body, whether political or governmental.” Likewise, Basic Law: Referendum, 5774-2014, stipulates that Israel’s sovereignty over part of its territory should not be waived unless the government has so decided and its decision is ratified by an absolute majority of members of the Knesset as well as in a referendum. It is clear that this provision is intended to make it difficult to partition Jerusalem between Israel and the Palestinians or renounce the sovereignty of Israel in the Golan Heights, in whole or in part. This is the background of the political, national, historical, religious, and legal struggle between Jews and Muslims and between Israel and the Palestinians, the Arab states, and their supporters regarding the political future of east Jerusalem, in general, and the Temple Mount in particular. Against this backdrop, only some of the countries of the world recognize the legality of Israel’s rule in west Jerusalem, and even this only on a de facto basis. This is apart from Russia, which on April 6, 2017, recognized western Jerusalem as the capital of Israel and eastern Jerusalem as the capital of the future state of Palestine, the United States, which only on December 6, 2017, recognized Jerusalem as the capital of Israel, and the Czech Republic, which on the same day recognized only western Jerusalem as the capital of Israel (as detailed in Chapter 3 below). However, all other countries reject the legality of Israel’s rule in east Jerusalem, both de facto and de jure, and do not recognize united Jerusalem as the capital of Israel. For this reason, no country in the world, including those with diplomatic relations with Israel, maintains an embassy in Jerusalem. To support their political position, the United Nations and these countries have developed a legal thesis whereby Jerusalem is “occupied territory,” illegally annexed by Israel from Jordan, in the course of a war with Jordan, contrary to the rules of international law. Therefore, the Palestinians, the Arab states, and the rest of the Muslim countries demand the transfer of east Jerusalem to a sovereign state of Palestine as its capital, should such a state be established in the West Bank after it is handed over by Israel to the Palestinians. As noted, other countries of the world have never recognized the legality of Israel’s rule in “east Jerusalem,” and maintain that its political status be decided only through negotiations between Israel and the Palestinians. The following article is intended to provide an appropriate legal response to the worldwide repudiation of the legality of the rule of Israel in the whole of Jerusalem and the unification of the city, and completely refute it. On November 29, 1947, the UN General Assembly adopted a resolution (the “Partition Plan”) on the future of the rule of Palestine), recommending its partition into two states – Jewish and Arab – with the exception of Jerusalem. In view of the holiness of Jerusalem to the three monotheistic religions, the UN General Assembly recommended that the city (including Bethlehem) be a “separate body” (corpus separatum) with an international administration under the auspices of the United Nations.4 The Arabs in the area and in the Arab countries expressed vehement opposition to the General Assembly resolution and on the very day following the adoption of the Partition Plan launched a war to thwart it. Initially, irregular Arab forces and gangs attacked the Jewish towns and villages throughout Eretz Yisrael, but after the declaration of the establishment of the State of Israel on May 14, 1948 (the “Declaration of Independence”), five Arab states invaded Israel with the aim of destroying the infant Jewish state. This was the “War of Liberation” or “War of Independence” of the State of Israel. On August 22, 1948, al-Tal and Dayan met again to confer on Jerusalem’s no-man’s land (see photograph). At the end of the war between Israel and Jordan, an armistice agreement was signed between the two countries on April 3, 1949, according to which Jerusalem was divided into two: the western part to be held by Israel and the eastern part to be held by Jordan, adopting the municipal border as determined in the map attached to the “honest truce agreement” referred to above. The entire Old City, the neighborhoods to its north, and the Mount of Olives were in Jordanian territory. The western part of the city, as well as an enclave on Mount Scopus in the northeast of the city (according to the above agreement), were in the Israeli domain. A UN-controlled demilitarized zone was created in the High Commissioner’s palace area (Armon Hanatziv), and the palace itself became the headquarters for the UN observers. A crossing point between the two parts of the city was established at the Mandelbaum Gate, operated by customs officials and used mainly for the passage of diplomats and UN personnel, as well as the passage of Christian pilgrims on Christmas Day. Every fortnight a convoy of doctors, nurses, university workers, and police guards left for the Israeli enclave on Mount Scopus. Any law applying to the whole of the State of Israel shall be deemed to apply to the whole of the area including both the State of Israel and any part of Palestine which the Minister of Defense has defined by proclamation as being held by the Defence Army of Israel. Section 3 of the Ordinance gave retroactive effect to the IDF proclamation regarding the application of Israeli law to west Jerusalem. On September 14, 1948, the Supreme Court was transferred to Jerusalem. On December 20, 1948, the government decided to transfer its institutions to Jerusalem. On December 31, 1948, the Jerusalem City Council was established. At the end of the debate, the Speaker of the Knesset stated that “the entire Knesset is united in a declaration that Jerusalem is an inseparable part of the State of Israel, and no foreign rule may be imposed on it in any way.”13 In response to another resolution of the UN General Assembly on December 9, 1949, regarding the internationalization of Jerusalem [No. 303 (iv)], a debate was held in the Knesset on December 13, 1949, on “the transfer of the Knesset and the Government to Jerusalem.” In this debate, the Prime Minister declared that “for the State of Israel there has and always will be one capital only – Jerusalem the Eternal. Thus it was 3,000 years ago – and thus it will be, we believe, until the end of time.”14 At the end of the discussion, the Knesset decided to move its seat from its temporary residence in Tel Aviv to Jerusalem,15 and as of December 26, 1949, it has only convened there. There are four main opinions regarding the status of west Jerusalem in terms of international law.18 According to the first opinion, held by many Israeli and foreign jurists,19following the conclusion of the British Mandate in Palestine, a vacuum in sovereignty was created in the area, including Jerusalem – which could only be filled through a legal process. The war waged by the Arabs of Holy Land and the Arab countries against the Jewish state with the aim of thwarting the UN Partition Plan constituted a flagrant violation of the Partition Plan and the rules of international law prohibiting the use of force (Article 2(4) of the UN Charter). At present, the entire world, apart from Russia, the United States, and the Czech Republic (details in Chapter 3 below) continue to refuse to officially recognize west Jerusalem as the capital of Israel. Even those countries that have diplomatic relations with Israel only recognize Israeli rule in west Jerusalem on a de facto basis. In practical terms, this position was expressed in the diplomatic boycott imposed in the distant past on west Jerusalem, situating the diplomatic missions of all the countries possessing diplomatic relations with Israel, including the United States, outside Jerusalem, usually in Tel Aviv. (However, the seat of the diplomatic missions of Bolivia and Paraguay are located in Mevasseret Zion near Jerusalem). New ambassadors of these countries were instructed to refrain from submitting their credentials to the President of the State of Israel in Jerusalem, as is customary. Foreign consuls stationed in the city refused to receive an exequator from the Israeli Foreign Ministry in Jerusalem to carry out their duties in the city, as is customary. Other measures included the avoidance of contact with government officials in Jerusalem, refusal to sign international agreements in Jerusalem, absence from official ceremonies in Jerusalem, and more. Over the years, the diplomatic boycott of Israel weakened, and the number of diplomatic missions based in west Jerusalem reached 18 out of the 38 foreign diplomatic missions in Israel in November 1975. According to international practice, diplomatic missions are usually located in the capital of the host country.26 Thus, it was possible to infer from the location of certain diplomatic missions in Jerusalem that the countries establishing these missions recognized west Jerusalem as the capital of Israel. Nonetheless, all these missions left Jerusalem in 1980, following the enactment of Basic Law: Jerusalem, Capital of Israel, 5740-1980, and after the passage of UN Security Council Resolution 478 in August 1980 (see below). In view of all this, and particularly in light of the Palestinians’ demand that the capital of a future Palestinian state be established exclusively in east Jerusalem, there is no justification, politically and legally, for almost the entire world, apart from Russia, the United States, and the Czech Republic, not to recognize western Jerusalem as the capital of Israel, particularly prior to 1967, before the dispute over the unification of the city and the legality of Israel’s rule in east Jerusalem erupted. On June 5, 1967, the Six-Day War broke out. Early that morning, Israel tried to persuade Jordan not to intervene in the war. At first, it conveyed a message to Jordan via General Odd Bull, head of the UN observers in Jerusalem, and through the U.S. embassy in Amman, Jordan, assuring Jordan that Israel would not attack unless first attacked by Jordan. King Hussein, who believed Egypt’s false reports of the Egyptian army’s victories in battles with Israel, rejected Israel’s promises and that very morning announced on the radio to his people that war had commenced. Immediately afterward, at about 11:30 am, the Jordanians opened fire with light arms, mortars, and cannon along the entire municipal border of Jerusalem. Jordanian tanks were moved into the West Bank and the hills overlooking Jerusalem, despite assurances given to the Americans by the Jordanians that the American-made armor would not cross the Jordan River. A tank battle took place in Jerusalem on the Tel el-Ful hilltop where King Hussein had begun to build a palace. During the first day, about 20 residents of Jerusalem were killed by Jordanian fire, and many buildings were damaged, including the Knesset building and several Christian sites: the Dormition Abbey, the Church of St. Peter in Gallicantu, and the Franciscan Monastery on Mount Zion. In response, the IDF returned fire, paralyzing most of the sources of fire. At approximately 1:00 pm, the Jordanians captured Armon Hanatziv and the surrounding area. However, within 40 minutes, an armored unit of the Israel Defense Forces (IDF) captured the High Commissioner’s palace and its surroundings from the Jordanians. A government decision, whereby the law, jurisdiction, and administration no longer apply to territory, requires the approval of the Knesset, which shall be given by a majority of its members. A government decision approved by the Knesset, as provided in Section 2, also requires approval in a referendum, to be passed by a majority of the valid votes of the participants in the referendum. In other words, it will not be possible to relinquish territories to which Israeli law applies, such as east Jerusalem, unless a government’s decision on this matter is approved by a majority of votes, both in the Knesset and in a referendum. However, since this law provides that the section relating to the referendum will apply only when a Basic Law is adopted regulating the referendum in question, and such legislation has not yet been passed, the possibility of holding a referendum remains one on paper only, until the required law is enacted. In order to enable the practical regulation of a referendum, as required to relinquish Israeli sovereignty in any part of its territory, on March 12, 2014, the Knesset adopted Basic Law: Referendum, 5774 – 2014.43 The law applies to the entire territory of the State of Israel within the boundaries of the “Green Line” (the territory of the State of Israel according to the demarcation lines as set out in the Armistice Agreements with its Arab neighbors signed in 1949 following the War of Independence), as well as east Jerusalem and the Golan Heights. No authority that is stipulated in the law of the State of Israel or of the Jerusalem municipality may be transferred either permanently, or for an allotted period of time, to a foreign body, whether political, governmental, or any other similar type of foreign body. On January 2, 2018, the Knesset reinforced the entrenching provision in Section 7 above by increasing the majority required for amending Sections 5 and 6 of the Law to a special majority of 80 MKs.51 Likewise, Section 7 itself was entrenched: Whereas under the previous language an ordinary proportionate majority of MKs was sufficient (i.e. a majority of those present at the vote), Section 7 of the Law was amended so that any further amendment now requires a majority of 61 Knesset members, that is, a special and absolute majority. However, the consequence of this is that now it is possible to change the statutory requirement for a majority of 80 MKs, as a condition for relinquishing part of Jerusalem, even by a majority of only 61 MKs. Basic Law: Jerusalem, Capital of Israel, was also harshly criticized by the major UN institutions: On August 20, 1980, the Security Council adopted Resolution 478 almost unanimously – only the United States abstained – condemned the enactment of the law, determined that the law contravened international law and posed a serious obstacle to achieving peace, and stated that it was invalid and void.53 East Jerusalem was defined in the resolution as “occupied territory,” to which the Fourth Geneva Convention of August 1949 relative to the protection of civilians during wartime applied. In this resolution, the Security Council called on all countries with diplomatic embassies in Jerusalem to remove them. The 18 countries, which held such embassies, accepted the decision and moved them out of the city. Following diplomatic pressure on Costa Rica, the latter returned its embassy to Jerusalem in 1982. In 1984, the embassy of El Salvador was also returned to Jerusalem. However, in the summer of 2008, following the Second Lebanon War and in order to improve their relations with the Arab countries, these two countries again withdrew their embassies from Jerusalem. Jerusalem thus became the only capital in the world without a single embassy. The Council also “underlines that it will not recognize any changes to the 4 June 1967 lines, including in Jerusalem, other than those agreed by the parties through negotiations.” (Article 3 of the resolution) It should be noted that this article appeared here, for the first time, and was not included in previous UN resolutions. In other words, this was the first time that the United Nations had decided that the political future of the territories taken by Israel in June 1967, and the borders of Israel, would be determined solely by negotiation between the parties, the precise identities of which – apart from Israel – were not specified. The resolution was adopted by virtue of Chapter VI of the UN Charter and consequently was not obligatory and did not include the imposition of sanctions on Israel for its violation. The resolution was adopted by a majority of 14 of the 15 Council members and aroused great anger in Israel, since for the first time in many years the United States (under President Obama) had failed to veto such a resolution but merely abstained from voting, thereby enabling the resolution to pass. In consequence of these resolutions, today too, though Israel maintains diplomatic relations with 159 countries (out of some 200 recognized countries), none (apart from Russia, the United States, and the Czech Republic) currently officially recognize Jerusalem as the capital of Israel, none maintain an embassy in Jerusalem, and they are represented by 88 embassies, all of which are located outside of Jerusalem. It should be noted that France maintains three separate consulates in Israel: one in Haifa (37 HaGefen Street), one in Tel Aviv (1 Ben Yehuda Street), and one in west Jerusalem (5 Emile Botha St., near the King David Hotel). All the foreign consulates operated in Jerusalem before the unification of the city in June 1967, and some were even active in the city during the Ottoman period. Since June 1967, Israel has not permitted any state to open a new consulate in Jerusalem, but only an embassy, in view of its desire to encourage recognition of Jerusalem as the capital of Israel and pursuant to the international diplomatic practice of embassies being located in the capital of the host country. providing notarial services, verifying birth certificates, marriage certificates, death certificates, etc. (e) representing or ensuring the representation of the nationals of the sending state in legal proceedings in this receiving state, particularly in cases of detention and arrest. (f) assisting the citizens of the sending state, including the crew of vessels and aircraft registered in the sending state, in cases of distress and emergency. The foreign consulates in Jerusalem serve the residents of Jerusalem (Jews and Arabs alike), the territories, and Gaza in all the above matters. In all political matters, Israel maintains contact only with the embassies of the countries maintaining diplomatic relations with it. For some reason, this surprising historic declaration received no significant attention from any country, including Israel; it failed to provoke any controversy or demonstrations and was not discussed at the United Nations, despite being of no less importance than the United States’ recognition of Jerusalem as the capital of Israel on December 6, 2017 (see further Section 3 below), and perhaps even exceeding it. On December 25, 2017, Guatemalan President Jimmy Morales also announced his decision to restore72 his country’s embassy to Jerusalem and ordered his country’s foreign ministry to prepare for this without setting a specific date for the transfer of the embassy.73 Although the President of Guatemala did not declare his country’s recognition of Jerusalem as the capital of Israel, such recognition is implicit in his decision, since according to accepted diplomatic practice, a foreign embassy is usually located in the capital of the host country. The United States Embassy in Israel should be established in Jerusalem no later than May 31, 1999. It appears from the language of this section (the cumulative effect of the first two subsections) that the United States officially recognized unified Jerusalem as the capital of Israel. And indeed, the preamble to the resolution adopted by the two houses of the U.S. Congress on the occasion of the 30th anniversary of the unification of Jerusalem stated that United States’ policy is that “Jerusalem should remain the undivided capital of Israel.”78According to the above-mentioned section, the U.S. embassy, located in Tel Aviv, was supposed to move to Jerusalem by May 1999. The U.S. administration, headed by President Bill Clinton, was vehemently opposed to this legislation. However, the Act was passed with such a large majority (about 90 percent in both Houses of Congress), that it was apparent to the President of the United States that the exercise of his constitutional right to veto it would not prevent its enactment into law by the American Congress in a revote, as required following a presidential veto.79 Accordingly, the President did not impose a veto on the Act, and it entered into force. The Act states that the U.S. State Department will be subject to severe financial sanctions in the form of significant cuts in its budget each year until 1999 (at which time half of its budget for the purchase and maintenance of buildings abroad would be frozen) if it failed to meet its obligations pursuant to the law to transfer the U.S. Embassy in Jerusalem by the aforementioned date. However, under Section 7 of the Act, the President of the United States was granted the authority to postpone the transfer of the embassy to Jerusalem as of October 1, 1998, and to do so every six months, provided that he reported to the Congress that such deferral was necessary “to protect the national security interests of the United States” and specifying his reasons for this decision. Indeed, in a statement issued by the White House immediately after the adoption of the law in the U.S. Congress, President Clinton announced that he intended to use the authority granted by the law to postpone the transfer of the embassy to Jerusalem, even though his attitude to Israel and his position on Jerusalem had not changed. The President reiterated his position that building the U.S. embassy in Jerusalem, at that time, would cause serious damage to the peace process.80 Since then, all U.S. presidents have repeatedly used this authority, every six months, to defer the transfer of the U.S. Embassy to Jerusalem. Likewise, on June 1, 2017, the current president, Donald Trump, signed an order deferring the transfer of the U.S. embassy to Jerusalem for six months, in complete contradiction to one of the main promises in his campaign for the U.S. presidency. Moreover, representatives of the United States, like the representatives of other countries, continue to consistently avoid holding any official meetings in government offices or other Israeli institutions in east Jerusalem or visit east Jerusalem when accompanied by Israeli officials. This policy is inconsistent with the enactment of the “Jerusalem Embassy Act,” according to which the U.S. Congress declared (a declaration unprecedented in any other country) the United States’ recognition of Jerusalem as the undivided capital of Israel. This is also clearly expressed in the language of the section itself, in the future tense in which it is phrased, and in the description of the desired situation, in contrast to the mere recognition of the present situation: “Jerusalem should remain a united city … and it should be recognized as the capital of the State of Israel.” In other words, the law determines only the desired policy in this regard in the opinion of Congress and does not in itself constitute recognition of a unified Jerusalem as the capital of Israel. In spite of the official policy of the United States not to recognize Israel’s sovereignty in east Jerusalem, it did recognize that east Jerusalem was an integral part of Jerusalem and under Israeli sovereignty for the purpose of the extradition of an American citizen, Joel Davis, who had been convicted in the United States of committing serious criminal offenses and fled to Israel. In an extradition hearing in the Jerusalem District Court, counsel for Joel Davis argued that since the extradition treaty between Israel and the United States applied only to the territory of the State of Israel, and the defendant had been arrested in east Jerusalem, which was outside the territory of the State of Israel, at least according to the aforementioned position of the United States, the extradition treaty did not apply to him. In other words, in this case, the United States recognized east Jerusalem as part of the territory of the State of Israel. A decisive legal expression of the United States’ failure to recognize Israeli sovereignty in east Jerusalem was recently given in the U.S. Supreme Court’s ruling of June 8, 2015, in the Menachem Zivotofsky case,83 which occupied the U.S. courts at all levels for about 13 years. This case concerned a Jewish child born in 2002 in Jerusalem, to a Jewish couple with American citizenship who lived in Jerusalem. Based on the Foreign Relations Authorization Act of 2002 (which defined Jerusalem as the capital of Israel), the child’s mother asked the U.S. embassy in Israel to register in his American passport that he was born in Israel. The embassy officials refused to do so, and Menachem Zivotofsky’s parents filed a lawsuit on his behalf against the U.S. Secretary of State, John Kerry, to register in their son’s passport that he had been born in Israel since Jerusalem was within the territory of the State of Israel and under its sovereignty. After a 13-year legal campaign, the U.S. Supreme Court handed down its ruling (close to the child’s bar mitzvah) dismissing the parents’ petition. According to this ruling, the 2002 Act was invalid as the President of the United States had exclusive authority to recognize foreign countries, including the territory over which they were sovereign. Therefore, in view of the position of U.S. presidents who refused to recognize Israeli sovereignty in Jerusalem until this matter was settled in peace negotiations, the American administration would not be required to register in an American passport that Jerusalem was within the borders of the State of Israel – contrary to the consistent position of U.S. presidents. However, a few hours after this writing, on December 6, 2017 there was a dramatic and historic shift in the White House’s policy regarding the status of Jerusalem: Despite the warnings of the European countries, Egypt, Saudi Arabia, and Jordan regarding the “destruction of the political process” and threats made by the Palestinian Authority, Hamas, and Hizbullah regarding “the outbreak of a new intifada,”84 U.S. President Donald Trump announced in a special speech at the White House that the United States recognizes Jerusalem as the capital of Israel and that he had instructed the State Department to prepare for the transfer of the U.S. embassy from Tel Aviv to Jerusalem, without setting a date for this move. In other words, this was a sophisticated formulation that referred to the positions of both sides: on the one hand, explicit recognition of Jerusalem as the capital of Israel, and on the other, refraining from using the Israeli language of “unified Jerusalem” or determining the “specific” boundaries of the recognized capital. Put differently, the United States left the door open to negotiations between Israel and the Palestinians as to these borders, thereby displaying willingness on the part of America for the “parties” to negotiate the division of Jerusalem into two capitals, Israeli and Palestinian. It is now possible to expect that the U.S. Supreme Court will also give expression to the significant change in the position of the U.S. presidents regarding Jerusalem, and instruct the State Department to register in the American passport of a child born to American citizens in Jerusalem, that he was born in Israel, unlike the ruling in the above Menachem Zivotofsky case. Initially, the EU countries, many of which are Catholic, were influenced by the Vatican’s position on these questions:89 In 1947-1948, they supported the territorial internationalization of Jerusalem because – in accordance with the Vatican position – they believed it necessary to protect the Holy Places. Afterwards, they differed as to the nature of the desired internationalization: territorial (most of the states), or functional (supported by Holland and Sweden). No EU country recognized the legality of Israel’s rule in west Jerusalem and Jordan’s rule in east Jerusalem. In the 1970s, these countries still considered that the preferred solution was the territorial internationalization of Jerusalem, and they made this explicit in a declaration by the nine European Community member states (the former name of the EU) on November 6, 1973, when they called on Israel to end its rule in east Jerusalem. Since then, they have joined all the decisions of the UN institutions that have repeatedly condemned the occupation of east Jerusalem and the measures taken by Israel to change the legal status of east Jerusalem – and have called on Israel to withdraw from that part of the city. the special importance of the role played by the question of Jerusalem for all the parties concerned […] they will not accept any unilateral initiative designed to change the status of Jerusalem. […] Any agreement on the city’s status should guarantee freedom of access for everyone to the holy places. The EU foreign ministers prepared a comprehensive report on the main problems of the Israeli-Arab conflict, including the Jerusalem problem, and determined that the solution lay in the application of an international regime to the eastern part of the city. In other documents prepared for the Council’s political committee, it was proposed to hand over the Old City of Jerusalem to the administration of a special UN representative for a limited number of years and to replace the Israeli forces in the Old City with international forces. This would guarantee freedom of access to the holy sites, civilian administration of the city, and deferment of the decision regarding the sovereignty of east Jerusalem. The Old City will be of a similar status to that of the Vatican […] The religious sites outside the Old City will be regarded as having extraterritorial status, similar to a number of churches in Rome outside the Vatican walls. Israel’s settlement policy in the occupied territories presents a growing obstacle to peace in the region […] Jewish settlements in the territories […] including east Jerusalem, are illegal under international law, [the Council] calls earnestly on the government of Israel not to permit settlements there. The Council of Ministers of the European Union reiterated on October 1, 1996, that “the European Union views east Jerusalem as subject to the principles set out in Security Council Resolution 242” (inadmissibility of the acquisition of territory by force) and therefore that this part of the city was not subject to Israeli sovereignty; this was occupied territory, to which the Fourth Geneva Convention applied. It should be recalled that the UN General Assembly used the term “corpus separatum” in the Partition Resolution of November 1947 to describe Jerusalem’s special status as an international city. A large number of additional documents indicate that the internationalization of Jerusalem was the preferred solution of the European Union, whether in respect of the entire city or just the Old City. In the years that followed, however, the European Union abandoned the solution of the internationalization of Jerusalem and adopted a new position under which Jerusalem should be the capital of the State of Israel and the State of Palestine, according to the “vision of two states for two peoples,” and that the final status and borders of Jerusalem should be determined only in negotiations between Israel and the Palestinians. In other words: Jerusalem should be divided into two capitals: west Jerusalem would be the capital of Israel, and east Jerusalem the capital of Palestine. The borders of both capitals would be determined in negotiations between Israel and the Palestinians. Jerusalem is the capital of the Palestinian state and is the main and eternal seat of the three branches of government: the legislature, the executive, and the judiciary. The Palestinian state has sovereignty over Jerusalem and its holy sites, and is responsible for protecting them and guaranteeing freedom of worship and the observance of all religious ceremonies in them. Each year a special part of the general budget will be allocated for the city of Jerusalem, projects and programs will be prepared to encourage public and private investment, and it will remain a special priority development area. Any legislation or agreement derogating from the Palestinian right in Jerusalem or which are contrary to the provisions of this Law shall be deemed null and void. This Law shall not be amended or repealed except by a two-thirds majority of the Legislative Council. All parties concerned shall do everything necessary for the implementation of this Law. This law will be valid from the date of its issue and publication in the Official Gazette. The law was signed by Yasser Arafat as President of the State of Palestine, as Chairman of the PLO Executive Committee, and as Chairman of the Palestinian Authority. stated that their purpose is to “prevent political or governmental activity in the territory of the State of Israel, without the consent of the Government of Israel, which is incompatible with respect for the sovereignty of the State of Israel by the Palestinian Authority or the PLO.” In addition, Section 97(a) of the Penal Law, 5737-1977,101 states that “if a person commits an act liable to impair the sovereignty of the state with the intention to impair that sovereignty, then he is liable to the death penalty or life imprisonment.” It appears that in Section 4 of the “Law of the Capital,” the Palestinian legislature intended to undermine the validity of Basic Law: Jerusalem, Capital of Israel. However, it is clear that the Palestinian Authority cannot annul the law of the Israeli Knesset in respect of Jerusalem, which is located in the territory of the State of Israel, and outside the Palestinian self-rule area. International law experts, as well as Israeli jurists, differ as to the legality of Israel’s measures regarding the unification of Jerusalem in the view of international law.103 The main argument against the legality of the unification of Jerusalem is that east Jerusalem is “occupied territory,” which Israel forcibly took from Jordan in the Six-Day War in contravention of the prohibition on the use of force “against the territorial integrity or political independence of any state” in Article 2 (4) of the UN Charter.104 Accordingly, this prohibition is also noted in most UN resolutions as one of the main reasons for denying the legality of the application of Israel’s control over east Jerusalem. In other words: according to international law, in order for an area to be considered “occupied territory” of a previous state, the latter must be the legal sovereign in that territory.113Therefore, in the opinion of the above jurists, since Jordan did not have legal sovereignty in east Jerusalem, Israel’s takeover of this territory in June 1967 did not transform it into “occupied territory,” and the laws of occupation do not apply there. According to international law, it is also possible to acquire sovereignty in an area occupied during wartime by means of a peace agreement signed between the occupying state and the state whose territory has been occupied, and indeed Jordan signed a peace agreement with Israel (on October 26, 1994) without east Jerusalem being restored to it.116 Article 9 of the agreement states that “Israel respects the present special role of the Hashemite Kingdom of Jordan in Muslim holy shrines in Jerusalem. When negotiations on the permanent status will take place, Israel will give high priority to the Jordanian historic role in these shrines.” However, it is clear from this provision that Jordan no longer demands the return of east Jerusalem to its sovereignty and is satisfied with Israel’s promise to give “high priority to the Jordanian historic role,” which is confined solely to the Muslim shrines in Jerusalem, “when the final status negotiations” take place in respect of Jerusalem. Notably, Israel did not undertake to give Jordan control over, nor indeed the right to administer these sites, but only offered “high priority” to the historic Jordanian role in these places, without clarifying the nature of this “role.” Equally, the permanent status of the sites was not promised to Jordan but only negotiations on this issue, and even that not necessarily with Jordan alone. Accordingly, the wording of the provision may be seen to imply Jordanian concession of east Jerusalem in favor of Israel, as required by the above rules of international law for the purpose of lawful acquisition of sovereignty in this territory. Article 9 of the peace agreement was an exact copy of a clause that appeared in the agreement to end the state of armed conflict between Israel and Jordan, signed in Washington on July 25, 1994, which has since been called the “Washington Declaration.” In this declaration, Israel officially recognized – for the first time since its establishment – Jordan’s “special role” in the Muslim holy places in Jerusalem. In accordance with Article 9 of the peace treaty between Jordan and Israel, Israel respects the present special role of the Hashemite Kingdom of Jordan in the Muslim holy places in Jerusalem. Officials on behalf of the governments of Jordan and Israel are in constant contact regarding what occurs on the Temple Mount, including the activities of the Waqf in the place. For obvious reasons, it is not possible to openly detail the nature of these contacts, which touch upon issues at the heart of the foreign relations of the State of Israel. I should point out, as the one who headed the Israeli delegation to the peace treaty with Jordan, that this article (which had already appeared in the ‘Washington Declaration’ of July 25, 1994) was drafted uniquely (in an unusual and to some extent exceptional manner) by Prime Minister Yitzhak Rabin, personally. This article was originally intended to give expression to Jordan’s connection to the mosques on the Mount, where the Hashemite dynasty is considered and regards itself as the descendant of the Prophet Muhammad, who visited the place according to Islamic tradition on a miraculous night journey. King Abdullah, grandfather of the late King Hussein, in whose time the peace treaty was signed, and the greatgrandfather of the current king, who bears his name, was also murdered in the presence of his grandson Hussein in a mosque on the Temple Mount, and hence the special emotional bond, and I will not even consider the Jordanian-Palestinian aspects that were also in the background. The article is, as the state wrote in its response, the basis for the Waqf’s involvement. But, of course, within the scope of Israeli law, the legal authority from beginning to end rests with Israel and the Israel Police. Jordan illegally acquired its control of the West Bank of the Jordan River, using force, in the course of a war to thwart the UN Partition Plan. Indeed, the legality of the annexation of the West Bank to Jordan, by declaring it as such on April 28, 1950,126 was never recognized by any country in the world (including the Arab countries), apart from Britain and Pakistan. On July 31, 1988, King Hussein of Jordan announced the severing of the Jordanian administrative and judicial link to the West Bank of the Jordan River (except for its continued protection of the Muslim holy places in Jerusalem),127 thereby waiving Jordan’s right to return to rule there. Although the waiver was made in favor of the PLO as representative of the Palestinian people, since Jordan’s rule in that territory was not legal, as previously explained, it could not grant the Palestinians any right to rule there. Equally, in the Jordan-Israel peace treaty, there is no Jordanian demand for the return of the West Bank of the Jordan River to its territory, and this too can be seen as a relinquishment of Jordan’s rule there. Nonetheless, this important argument should be qualified, considering Article 3.2 of the agreement in question. This article states that the internationally recognized boundary between Israel and Jordan does not constitute a “prior determination as to the status of any territories that came under Israeli military government control in 1967.” As east Jerusalem includes not only former Jordanian Jerusalem but also 64.5 square kilometers of land and villages in the West Bank of the Jordan River (in Judea and Samaria), it may be argued that the final status of all these territories has not yet been determined! The Israeli Knesset refrained from using the term “annexation” when it applied Israeli law to the territories that were added to west Jerusalem (64.5 square kilometers in addition to Jordanian Jerusalem), not because this was prohibited under international law, but because it took the legal position that the above territories had been occupied by Jordan and illegally annexed to its territory following an unlawful attack on the State of Israel, designed to thwart its establishment in violation of the UN Partition Resolution (November 29, 1947). Additionally, because Jordanian Jerusalem (six square kilometers) had been illegally occupied by Jordan, contrary to the UN resolution designating this area as part of international Jerusalem under the control of a UN Special Commissioner. In domestic Israeli law, the Supreme Court has ruled that Israel has lawfully applied its government and laws to east Jerusalem.129 In this context, the Supreme Court, sitting as a High Court of Justice, rendered a ruling on January 16, 2002, in a petition regarding the jurisdiction of the Jerusalem Court for Local Affairs to hear matters relating to illegal construction by Palestinians in east Jerusalem.130 The petitioners argued that the Israeli courts had no jurisdiction to consider construction in east Jerusalem, as the application of Israeli law to east Jerusalem was illegal by virtue of being inconsistent with customary international law. The Old City (and its immediate surroundings) was declared on August 30, 1967, to be an “antiquities site”133 by virtue of the Antiquities Ordinance,134 which has since been replaced by the Antiquities Law, 5738-1978.135 As an “antiquities site,” the Old City enjoys special protection pursuant to the above law, and any activity there (including construction and demolition, alteration or old dismantling an antiquity, and even laying of soil) requires the approval of the Director of the Israel Antiquities Authority, as provided in Section 29(a) of the Law. According to Section 29(c) of the Law, “where an antiquities site is used for religious requirements or devoted to a religious purpose” (such as the Temple Mount), the consent of a special ministerial committee is also required, the members of which include the Minister of Religious Affairs, the Minister of Education and Culture, and the Minister of Justice. This list of sites does not necessarily mean that other sites in the Old City, the names of which are not mentioned, would not enjoy the protection of the above Convention. According to the decision of the UNESCO World Heritage Committee, the protection afforded by the Convention applies to the entire Old City, including all sites located therein. As the Old City is included in the World Heritage list, Israel, being the governing authority, is obligated “to do all it can, to the utmost of its own resources” in order to protect the Old City and identify and preserve its various sites to ensure its presentation and transmission to future generations. If necessary, Israel is entitled to “international assistance and co-operation, in particular financial, artistic, scientific, and technical” (Article 4 of the Convention). Each state party to the Convention must report to the General Conference of UNESCO on the measures it has taken to implement the provisions of the Convention (Art. 29). According to Article 13.3 of the Convention, the World Heritage Committee is authorized to determine the nature and extent of the international assistance required for the protection and conservation of natural and cultural assets, in accordance with the purposes of the Convention. Jerusalem is a unique city, historically, religiously, nationally, and legally, because of its great sanctity in the eyes of Judaism, Christianity, and Islam. It is the holiest city in the world for Judaism, by virtue of the Temple Mount, which was the site of the three Jewish Temples. This is the holiest place in the world for the Jews because, according to their faith, the Shechinah [divine spirit] dwells there forever. Thus, since its establishment, Jerusalem has been the capital of the Kingdom of Israel, the capital of the Kingdom of Judah, the capital of the Hasmonean Kingdom, and the capital of the State of Israel. Jerusalem is also sacred to Christianity, mainly because of important events that took place there in the life of Jesus, especially in his last days. Jesus was crucified and buried in the Church of the Holy Sepulcher, and there he was resurrected. It is the holiest place in the world for Christianity. From Jerusalem, the Twelve Apostles set out to spread the message of Christianity around the world. While Jerusalem was the capital of the Crusader Kingdom for part of the Crusader period (1099-1187 CE), the Christian countries have no political interest of their own in Jerusalem. Nonetheless, due to their economic and political ties with the Arab states, they deny the legality of Israeli rule in east Jerusalem and support the demand of the Palestinians and the Arab states to place east Jerusalem under the sovereignty of the future Palestinian state. 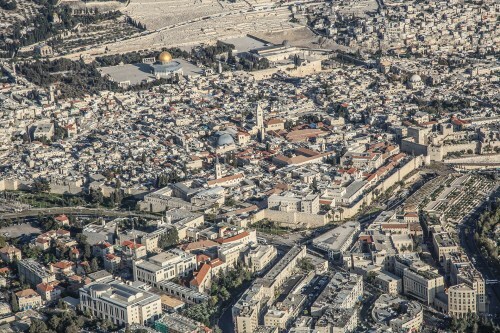 East Jerusalem is also sacred to Islam by virtue of the Temple Mount, which the Muslims call the Haram al-Sharif – the “Noble Sanctuary,” due to Islamic belief that at the end of his night journey from the Kaaba stone at Mecca the Prophet Muhammad landed at the site where the al-Aqsa Mosque was subsequently built. According to Islamic belief, he also ascended from the Foundation Rock located there (the Jewish “Holy of Holies”) to the heavens and received from Allah the five daily prayers that every Muslim is commanded to perform. Commemorating this ascent, the Muslims built the Dome of the Rock on this site, which currently serves as a mosque for women. Based on this belief, at the beginning of the eighth century, Jerusalem was recognized as the third most holy city for Islam, following Mecca and Medina. Following the international recognition of the twentieth-century Palestinian claim to a right of self-determination , the Palestinians demanded all the territories conquered by Israel from Jordan in June 1967 for the purpose of creating an independent Palestinian state there and establishing their capital in Jerusalem. This was primarily by virtue of the existence there of the Haram al-Sharif (Temple Mount), which became, in their view, a religious and national symbol. This is the background to the struggle for control of Jerusalem, and particularly east Jerusalem, between Israel and the Palestinians, which has been continuing for about 100 years. Unlike the Jewish population of Palestine, the Arabs did not agree to the UN Partition Plan of November 29, 1947, according to which the area would be divided into two states, Jewish and Arab, with a separate area of Jerusalem as an international area administered by the United Nations. Instead, they launched a war to thwart this plan. During this war, Jordan conquered the eastern part of Jerusalem, and Israel defended and conquered the western part of the city. Jordan and Israel agreed on the division of Jerusalem between them in the Armistice Agreement of April 3, 1949. The United Nations accepted the division of Jerusalem between Israel and Jordan, and over the years abandoned the solution of its internationalization. Almost the entire world became accustomed to this, albeit without formally recognizing (except Pakistan) the legality of Jordan’s rule in east Jerusalem and the legality of Israel’s rule in west Jerusalem. Until the early 1970s, some countries in the world only recognized de facto Israeli rule in west Jerusalem, and 18 of them even established their embassies there as a clear sign of their recognition of west Jerusalem as the capital of Israel. In early June 1967, Egypt, Syria, and Jordan attacked Israel. The war ended in six days in a crushing victory for Israel. At the beginning of the war, Jordan bombed Jerusalem and even occupied a small part of its territory (the High Commissioner’s Palace). Since Jordan did not heed Israel’s warnings to refrain from fighting against it, Israel conquered Jordanian Jerusalem (six square kilometers) and added to Jerusalem an additional 64.5 square kilometers of the land of 28 villages and towns in the West Bank. It applied its law, administration, and jurisdiction to all these territories under the designation of “east Jerusalem.” Israel hastened to build 13 new neighborhoods inhabited by 214,600 Israelis, compared with about 327,700 Arabs who live in the area of east Jerusalem. The struggle for the political future of east Jerusalem then renewed, reaching its peak when Israel declared unified Jerusalem as the capital of Israel in a Basic Law of that name in 1980. The United Nations has determined that Israel’s rule in east Jerusalem is illegal, that all measures taken by Israel to unify the city, and in particular Basic Law: Jerusalem, Capital of Israel, are null and void and that east Jerusalem is “occupied territory,” illegally annexed by Israel from Jordan, following war with Jordan, in breach of international law. The entire world has accepted this view, and the 18 countries that maintained embassies in west Jerusalem accepted the UN call and removed their embassies from Jerusalem to other places in Israel as a sign of diplomatic protest against the imposition of Israeli rule and laws on east Jerusalem. In addition, foreign countries currently maintain nine consulates in Jerusalem. However, none of them submitted an official request (exequator) to the Israeli Foreign Ministry for recognition as a consulate in view of the desire to avoid performing an act (submitting an application to the Ministry of Foreign Affairs) that would imply their countries’ recognition of Jerusalem as part of the State of Israel, contrary to the policy of these countries. Nevertheless, Israel grants foreign consulates in Jerusalem consular status and documentation under the Vienna Convention on Consular Relations, 1963. Contrary to the above, this article presents a completely different opinion, held by world-renowned experts in international law, whereby Israel has lawfully acquired sovereignty over both parts of Jerusalem as a matter of international law. According to this view, at the end of the British Mandate in May 1948, a vacuum was created in sovereignty over Jerusalem that could only be filled by legal action, such as by turning Jerusalem into an international city through acceptance of the UN Partition Resolution of November 29, 1947. However, in light of the rejection by the Arab states of the UN Partition resolution, and their armed aggression against Israel, aimed at thwarting the implementation of that resolution, which recommended establishment of two states, Jewish and Arab, with Jerusalem as an international city, this vacuum was ultimately filled by the conquest of west Jerusalem by Israel in exercise of its inherent right to self-defense, recognized in international law. Therefore, Israel became the legal sovereign in west Jerusalem. On the other hand, Jordan was not considered to be the legal sovereign in east Jerusalem, since it occupied the territory during the aforementioned aggressive to thwart implementation of the Partition Resolution. Evidence of this may be found in the fact that no country in the world (including the Arab states), apart from Pakistan, recognized the legality of Jordan’s sovereignty over east Jerusalem. The same principle is equally applicable to the 64.5 square kilometers of territory attached to Jerusalem at the end of June 1967. Jordanian rule in these territories similarly lacked legality as they had been occupied by Jordan in an aggressive war initiated by the Arab states in order to thwart the UN “Partition Plan” of November 1947. Subsequently, Jordan relinquished its authority there, both with its July 1988 announcement that it was severing its legal and administrative ties to these areas, as well as the fact that it did not demand to restore them from Israel as part of the October 1994 Treaty of Peace between Israel and Jordan. East Jerusalem cannot be considered “occupied territory.” For such status to be accorded to a particular territory, international law requires that the state whose territory was occupied must have been the legal sovereign of the territory in question. However, as explained, Jordan was not the legal sovereign of east Jerusalem, since it acquired the territory unlawfully, during the course of an aggressive war. Accordingly, Israel acquired sovereignty in east Jerusalem, and legitimately unified the two parts of the city at the end of June 1967 and later proclaimed united Jerusalem as the capital of Israel in its 1980 Basic Law. Prof. Schwebel and Prof. Blum have argued, as set out above, that Israel holds the best relative legal right in respect of both parts of Jerusalem, and no other country (including Jordan and the Palestinian Authority), can legally surpass Israel’s right. Contrary to the position taken by the majority of countries of the world, on April 6, 2016, Russia recognized west Jerusalem as the capital of Israel and concurrently recognized east Jerusalem as the capital of a future Palestinian state. On December 6, 2017, in a special speech by President Donald Trump, the United States recognized Jerusalem as the capital of Israel. However, the U.S. President refrained from referring to “united Jerusalem” or “undivided Jerusalem,” and stressed that the United States “does not take a position on permanent issues, including the specific borders of Israeli sovereignty in Jerusalem.” In this way, President Trump expressed his acquiescence in negotiations between Israel and the Palestinians regarding the issue of Jerusalem, including the Palestinian desire for two capitals, an Israeli capital and a Palestinian capital. The U.S. president further instructed the State Department to prepare for the transfer of the U.S. embassy from Tel Aviv to Jerusalem, scheduled for Israel’s 70th Independence Day anniversary in May 2018. President Donald Trump shows a statement announcing intention to move the U.S. embassy in Israel to Jerusalem, December 6, 2017. Immediately thereafter, the Czech Republic announced its recognition of west Jerusalem as the capital of Israel, and on December 25, 2017, the President of Guatemala announced his decision to return the Guatemalan embassy to Jerusalem, thereby implying Guatemalan recognition of Jerusalem as the capital of Israel, in view of the diplomatic practice of locating the diplomatic mission in the capital of the host country. I would like to express my gratitude to the Jerusalem Center for Public Affairs, led by Dr. Dore Gold, and the Center’s Director General, Chaya Herskovic, for their readiness to publish my research and all of their dedicated assistance with this project. I would also like to thank Judge Moshe Drori, vice president of the Jerusalem District Court, and Amb. Alan Baker, former Israeli ambassador to Canada and legal adviser to the Israel Foreign Ministry, who made several important, effective comments on this monograph, contributing to its improvement. I am extremely grateful to Dr. Adv. Rachel Rimon for her faithful, excellent translation of the monograph into English, and to Lenny Ben-David for his professional, insightful editing. Chapter One is based on my book Wars of the Holy Places, Jerusalem Institute for Israel Studies and Hed Artzi, 2000, at pp. 370-383, and How Awesome is this Place, Carta Press, Jerusalem, 2006, at pp. 100-101, 110-124, 176-178, 200-210. Josephus Flavius, Antiquities of the Jews, Book 15, Chapter 11; History of the Jewish War against the Romans (translated by L. Ullmann), Book One, Chapter 21, para. 401, Fifth Book, Chapter 5, paras. 184-237. Data received on December 3, 2017, from the Jerusalem Institute for Israel Policy Studies, correct to the end of 2016. The data will appear in a statistical study to be published by the institute in May 2018. A/Res/181. For the text of the resolution see: The Jerusalem Question and its Resolution: Selected Documents, edited by R. Lapidoth and M. Hirsch, Martinus Nijhoff Publishers, 1994, p.6 (hereinafter: “Lapidoth and Hirsch, Selected Documents”). Lapidoth, Basic Law: Jerusalem, Capital of Israel, The Hebrew University of Jerusalem, 1999 (hereinafter: “Lapidoth, Jerusalem, Capital of Israel”), at p. 20. For the text of the agreement, see: U.N. Doc. S/3015, of May 25, 1953. U. Narkiss, The Story of the “Municipal Line” in Jerusalem, Ariel Press, Jerusalem, 1986, at pp. 5-6. See, for example, Section 2(2) of the Armistice Agreement between Israel and Jordan dated April 3, 1949, Treaties No. 3, vol. 1, at p. 37. See also Y. Blum, “East Jerusalem is not ‘occupied territory’,” 28 Hapraklit (1975) 183, 184-186. In light of this, to this day Israel has refrained from establishing its boundaries, and instead of making an explicit determination of the borders, the Israeli legislature has determined that the territory to which Israeli law will apply is the area that “the Minister of Defense defined in the proclamation as being held by the Israel Defense Forces.” See: Section 1 of the Jurisdiction and Powers Ordinance, 5708-1948, above. See also the remarks of the Prime Minister and Minister of Defense at the time, D. Ben-Gurion on this matter, cited by A. Rubinstein and B. Medina, Constitutional Law of the State of Israel, Fifth Edition, at p. 83. Official Gazette, 5708, No. 12 at p. 66. Official Gazette, 5708, No. 23, Schedule A, at p. 61. M. Benvenisti, Facing the Closed Wall, Divided and United Jerusalem, Jerusalem, 1973, at pp. 46, 47. The Official Gazette of the State of Israel, No. 48 dated 4.2.1949, at p. 376. Records of the Knesset, vol. 3, at p. 221. Id., at p. 281; see also at p. 313. The First Knesset convened in Jerusalem at the Jewish Agency House on February 14, In the absence of proper conditions for Knesset activity in Jerusalem, it was necessary to temporarily transfer the Knesset sessions to the Kesem Cinema building in Tel Aviv. See: id., at p. 287. Records of the Knesset, vol. 4, at pp. 603, 615. For further steps to establish Jerusalem’s status as the capital of Israel, see A. Eldar and N. Goren, The Jerusalem Capital Ambush: The Political Maneuvers to Relocate the American Embassy in Israel, The Jerusalem Institute for Israel Studies, 2002, at pp. 14-16. See: Section 2 of Basic Law: The Knesset, 5718-1958, SH 5718, at p. 69; Section 2 of Basic Law: The Government, 5761-2001, S.H. 5761, at p. 158; Section 2 of Basic Law: The President of the State, 5724-1964, S.H. 5723, at p. 118; Section 15(a) of Basic Law: The Judicature, 5744-1984, S.H. 5744 at p. 78; Section 4.A. of the Chamber of Advocates Law, 5721-1961, S.H. 5721, at p. 178. For a brief survey and a rich bibliography on this subject, see Lapidoth, Jerusalem, Capital of Israel, Chapter Two, at pp. 39-42. For further details, see id., note 2 at p. 40. M. Hirsch and D. Hausen-Curiel, Whither Jerusalem – Proposals and Positions Concerning the Future of Jerusalem, Jerusalem Institute for Israel Studies, Jerusalem, 1994, at 13-19; Lapidoth, Jerusalem, Capital of Israel, note 2. Lapidoth, Jerusalem, Capital of Israel, note 3, at p. 40. Id., note 5 at p. 41. For details see: Alan Baker, “Is Jerusalem Really Negotiable? An Analysis of Jerusalem’s Place in the Peace Process,” Jewish Political Studies Review, Vol. 24, No. 3–4, at pp. 78-80. (http://jcpa.org/wp-content/uploads/2013/05/V24_3_5.pdf); Berkovitz, Wars of the Holy Places, at pp. 54-58, 400-402. See also: Address by Prime Minister D. Ben-Gurion in the Knesset on the Internationalization of Jerusalem, December 5, 1949, Records of the Knesset, vol. 3, p. 221. See: Lapidoth, Jerusalem, Capital of Israel, at p. 74, note 50. According to information I received from Adv. Alan Baker, former Israeli Ambassador to Canada and former Legal Adviser to the Israel Foreign Ministry. See: Lapidoth, Jerusalem, Capital of Israel, at p. 72, notes 44 and 45. See: Lapidoth, Jerusalem – Legal Aspects, Jerusalem Institute for Israel Studies, Jerusalem, 1999, Second Edition, at p. 15 alongside the reference to notes 61-62. Lapidoth, Jerusalem, Capital of Israel, at p. 40. For a detailed discussion of the positions of the parties involved in the peace negotiations regarding the status of west and east Jerusalem, see Berkowitz, Wars of the Holy Places, at pp. 384-395. For the text of the Hague Convention of 1907, the Geneva Convention of 1949 and the Laws of War Regulations, see: Land Law and International Law in Judea and Samaria, H. Arnon and C. Vinitzky, Tel Aviv, 2013, at p. 33, note 52 (place of publication on the Internet); M. Drori, The Legislation in the Judea and Samaria Area, Faculty of Law, The Hebrew University of Jerusalem, 5735-1978, at p. 49, note 3. Israel is a signatory to the Fourth Geneva Convention, 1949. See: Treaties No. 1 (30), at p. 559. For further details, see Lapidoth, Jerusalem, Capital of Israel, at pp. 51-54, Berkovitz, Wars of the Holy Places, at pp. 58-59. S.H. 5727, at p. 74. Regulation Files 2064 dated June 28, 1967, at p. 2690. For further details, see Lapidoth, Jerusalem, Capital of Israel, at pp. 51-54, and in particular the map on p. 24, id. Jerusalem Declaration (Expansion of the Municipal Boundaries), 5727 – 1967, Regulation Files 2065, at p. 2694. The municipal area of Tel Aviv is 51,830 dunams and the area of Haifa is 64,680 dunams. Berkovitz, Wars of the Holy Places, at p. 261. A/pv 1550 (12.7.67). See also Lapidoth, Jerusalem, Capital of Israel, at p. 23, note 28. For General Assembly Resolutions, see for example: A/Res/2253 (4.7.1967); A/Res/2254 (4.7.1967). For Security Council Resolutions, see for example: S/Res/252 (21.5.1968); S/Res/267 (3.7.1969); S/Res/271 (15.9.1969); S/Res/298 (25.9.1971). A/6793; S/8146 at pp. 1-2. S.H. 5759, at p. 86. S.H. 5774, at p. 400. For the text of this law see: S.H. 5740, at p. 186, and the description of the purpose of the law in the explanatory notes to the bill in the H.H., 5740, p. 285; for a detailed analysis of the provisions of this law, see Lapidoth, Jerusalem, Capital of Israel, at 63-110. For the meaning of the term “capital,” see H. Cohen, The Status of Jerusalem in the Law of the State of Israel, 40 Years in Jerusalem, edited by A. Ahimeir and I. Bar Siman Tov, Jerusalem Institute for Israel Studies, 2008, at pp. 375, 378-379. S.H. 5761, at p. 28. See the description of the purpose of the law in Clause 1 of the bill and the explanatory notes to the bill in H.H. 2908 of 18 July 2000, at p. 516; see also: Berkowitz, Wars of the Holy Places, at pp. 177, 260-261. The words “among other things” are intended to clarify that the law also applies to additional extensions of the municipal area of Jerusalem that were made in later years. See: Berkowitz, Wars of the Holy Places, id. The text of the agreement in Hebrew and English is available on the Knesset Internet site. According to information I received from a source who asked not to reveal his name. The text of the statutory amendment is available on the Knesset Internet site. For details, see Lapidoth, Jerusalem, Capital of Israel, at p. 57. S/Res/478. See also: S/Res/465 (1.3.1980); S/Res/476 (30.6.1980). A/Res/35/169. See also: A/Res/35/122 (17.12.1980). For a list of dozens of such decisions, see: note 194 on page 56 of my book: How Awesome is this Place, Carta, Jerusalem, 2006.
International Court of Justice, The Legal Consequences of the Construction of a Wall in the Occupied Palestinian Territory (Advisory Opinion, 9.7.04), Sec. 75. For a critique of this statement, see M. Hirsch, “The Legal Status of Jerusalem Following the ICJ Advisory Opinion on the Separation Barrier”, 38 Israel Law Review, (2005) at pp. 298, 303. See also A. Rubinstein and B. Medina, The Constitutional Law of the State of Israel, Schocken Press, Tel Aviv, 2000, vol. II, at p. 925. For the full text of the draft and the resolution (EJ-10/L.22), see the site: http://www.timesofisrael.com. The Security Council has five permanent members (the United States, Russia, the United Kingdom, France, and China) and 10 rotating members. Only the permanent members have veto power under Article 27.3 of the UN Charter. Haaretz and Yedioth Aharonot of December 19, 2017. For the text of the resolution and the results of the vote, see the above site. According to information I received from the Israeli Ministry of Foreign Affairs on January 11, 2018. According to information I received from the French consulate in Haifa on January 15, 2018. According to information I received from the Spanish consulate in Jerusalem on January 15, 2018. See: Berkowitz, Wars of the Holy Places, at pp. 347, 406, and according to information I received from the Ministry of Foreign Affairs on January 15, 2018. According to information I received from the Ministry of Foreign Affairs on January 14, 2018. For the text of The Vienna Convention on Consular Relations, 1963 see the website of the Office of Legal Affairs of the United Nations; and also U.N.T.S. 261. See: HCJ 256/01 Rabach et al v. Jerusalem Court for Local Matters, 56(2) PD 930, 934 opposite the letter F, and at p. 935 opposite the letters A-C; ALA 7092/94 Her Majesty the Queen in Right of Canada v. Addleson, 51(1) PD 695, para. 12 at pp. 639-641; and the list of references in CA (District Court of Tel Aviv) 4289/98 PDM 5758 (3) 1, at pp. 12-13, 14-16 (para. 5). According to information I received from the Foreign Ministry on January 15, 2018. For a detailed discussion of consular relations, the status of the consulate and consular officials, their rights and immunities, see R. Sabel and Y. Ronen, International Law, Third Edition, 2017, chapter 11, at pp. 257-270. Kol Israel Reshet Bet News of June 5, 2014. News from Ynet of April 6, 2017; Dr. R. Bergman, “Putin recognizes Jerusalem,” – on May 23, 2017. Israel Today of December 7, 2017, at p. 17. Haaretz of December 8, 2017, at p. 6, and of December 10, 2017 at p. 6. Guatemala maintained an embassy in west Jerusalem until 1980. It removed the embassy from Jerusalem in accordance with Security Council Resolution No. 478, and transferred it to Tel Aviv. News from Ynet of December 25, 2017; Haaretz of December 26, 2017. For details of the U.S. position, see Berkowitz, Wars of the Holy Places, at pp. 390-392. Ibid, at p. 391, and see SCOR, 24th Year, 1969, 1483rd Meeting July 1, 1969, at 11–12. The statements of the two ambassadors were also published in Lapidoth and Hirsch, A Collection of Documents, at pp. 174-177; 236-238. For the Camp David documents, see: Treaties 857, vol. 25, at pp. 509, 526. For the text of the law, see: Pub. L.104-45 (8.11.95) 109 Stat. 398. For a comprehensive study of the proceedings taken to transfer the U.S. Embassy to Jerusalem and relevant legislation see: A. Eldar and N. Goren, The Jerusalem Capital Ambush, above. The decision was made unanimously by the Senate on May 20, 1997 and by an absolute majority (406:17) in the House of Representatives on June 10, 1997. According to information I received from the American Culture Center from the research authors, Raphael Amelan and Jackie Stein, and I thank them. According to the Constitution of the United States, the President has veto power over laws passed by Congress. However, if the law, which the President vetoes, is approved again by Congress by a majority of more than 2/3 in both houses of Congress, the law enters into force. In the case at hand, as the “Jerusalem Embassy Act” was passed in the first place by a majority of about 90% in both Houses of Congress, despite the President’s public opposition to the law, the President saw no point in vetoing the Act. The President did not sign the law. However it came into force on November 8, 1995. See also Almanac, Congressional Quarterly, 1995, at pp. 10-23, H-210. G. R. Watson, “The Jerusalem Act of 1995,” Catholic University Review, vol. 45 (1996), at pp. 837, 846 etc. For the opinion that the Congress Act amounts to U.S. recognition of the unification of Jerusalem, see: M. Halberstam, “The Jerusalem Embassy Act: U.S. Recognition of Undivided Jerusalem as the Capital of Israel,” Bar-Ilan Law Studies, Vol. 14, 1998, at pp. 391, 395-396. Misc. App. (District Court Jerusalem) 186/87 Attorney-General vs. Yoel Davis, PDM 5749 (3) 336, 339 (para. 13). Zivotofsky v. Kerry, vol. 576 U.S (8.6.15) Docket No. 13-628. See: Haaretz of December 6, 2017 at p. 4. The full speech may be found on the Internet. State Department announces opening of U.S. Embassy Jerusalem, February 23, 2018, https://www.state.gov/r/pa/prs/ps/2018/02/278825.htm. See: Berkowitz, Wars of the Holy Places, at p. 393. An Entangled City, ed. by A. Ramon, The Jerusalem Institute for Israel Studies, 2003, at p. 400. The main points of this report were published in Haaretz on February 27, 2013. Haaretz on December 8, 2017. Haaretz on December 12, 2017. Wikipedia, “The Legal Status of Jerusalem”. The law was published in the Palestinian Authority daily Al-Hayat Al-Jadida on October 7, 2002. I thank the Middle East Media Research Institute (MEMRI), which translated the law into Hebrew, and provided me with the text. For further details see: Berkowitz, Wars of the Holy Places, at pp. 132-133, 137. S.H. 5755, at p. 85. S.H. 5758, at p. 22. S.H. 5737, at p. 226. For further details see: Berkowitz, Wars of the Holy Places, at pp. 387-389; Statements made by PA Chairman Mahmoud Abbas at a meeting of Arab League foreign ministers in Cairo on May 28, 2016 – Arutz Sheva Israel National News on the Internet of May 29, 2016; and at the Conference of Islamic Countries in Istanbul on December 13, 2017 – Haaretz of December 14, 2017. For a brief review of this issue, see Lapidoth, Jerusalem, Capital of Israel, at pp. 39-48; Berkowitz, Wars of the Holy Places, p. 443, note 5 (Chapter 6); M. Landau, Y. Blum and M. Rosen, “Arafat’s Lies,” Haaretz, January 3, 2001; and in particular the debate between Prof. Y. Blum and Prof. Y. Dinstein in a series of articles on the subject: Dinstein, “Zion in International Law Will Be Redeemed,” Hapraklit, 27 (1971), 5; Y. Blum, “Zion in International Law was Redeemed”, Hapraklit, 27 (1971), 315; Dinstein, “And the Redemption was not Redeemed,” Hapraklit, 27 (1971), 519; Blum, “East Jerusalem is not Occupied Territory,” Hapraklit, 28 (1975), 183. See: Y. Dinstein, The International Law and the State, Schocken and Tel Aviv University Press, Tel Aviv, 1971, at pp. 122-128; Y. Dinstein, Laws of War, Schocken and Tel Aviv University Press, 1983, at pp. 65, 210-213; Dinstein, “Zion in International Law Will Be Redeemed,” Hapraklit, 27 (1971), 5, 7-8; Y. Blum, “Zion in International Law was Redeemed,” Hapraklit, id., at 315-319. In the opinion of Prof. H. Grief, sovereignty over a given territory is transferred not only upon the signing of a peace agreement between the occupying state and the occupied state, but also upon subjugation or real and prolonged cessation of hostilities between the belligerent parties. See: H. Grief, The Legal Foundation and Borders of Israel under International Law, Mazo Publishers, Jerusalem, Israel, 2008, at pp. 279-302, including historical examples there. See also: Oppenheim, International Law, Sixth Edition, edited by H. Lauterpacht, Longmans, Green And Co. London, New York, Toronto, 1947, vol. 1, at pp. 518-525. For the text of these Regulations and the Convention, see note 30 above. E. Lauterpacht, Jerusalem and the Holy Places, The Anglo-Israel Association, London, 1968, at pp. 46-48. S.M. Schwebel, “What Weight to Conquest?” 64 American Journal of International Law (1970), at pp. 344, 345-346. Blum, “Zion in International Law was Redeemed,” Hapraklit 27, at pp. 318-321; Blum, “The Missing Reversioner: Reflections on the Status of Judea and Samaria”, Israel Law Review, vol. 3 (1968), at p. 279. J. Stone, Israel And Palestine – Assault on the Law of Nations, Baltimore, The Johns Hopkins University Press, 1981, at pp. 116-118. M.I. Gruhin, “Jerusalem: Legal and Political Dimensions in a Search for Peace,” 12 Case Western Journal of International Law, (1980), at pp. 169, 205-207. See in this regard: Y. Blum, “The Missing Reversioner: Reflection on the Status of Judea and Samaria” op. cit. at pp. 289-291; J. Stone, No Peace – No War in The Middle East, Legal Problems of the First Year, Sydney, 1969, Maitland Publication Pty. Ltd. For the International Law Association (Australian Branch), p. 39; M. Shamgar, “The Observance of International Law in the Administered Territories”, 1 (1971), IYBHR p. 264 ff. V. Glahn, The Occupation of Enemy Territory, 1957, p.139 (quoted in Blum’s aforementioned article, Hapraklit 27  in Note 16, at pp. 318-319); Arnon and Vinitzky, Land Law and International Law in Judea and Samaria, supra (note 30 above), at p. 84, and the references in note 32, ibid., Lauterpacht, Jerusalem and the Holy Places, cit. at pp. 49-50; Cf: HCJ 61/80 Haetzni v. The State of Israel, 34(3) PD 595,597 opposite letters E and F; Drori, Legislation in Judea and Samaria, p. 26. E. Benvenisti, The International Law of Occupation, 2nd ed. Oxford University Press, Oxford, 2012, at p. 207. For a detailed discussion of this right, see Dinstein, Laws of War, at pp. 65-94; Ben Naftali and Shany, International Law between War and Peace, supra note 101, at 76–103. See all references in notes 75-84 above. Yedioth Ha’aharonot of July 26, 1994; and Haaretz of July 27, 1994. Records of the Knesset, vol. 139, session of August 3, 1994, at p. 10261. For further details, see Berkovitz, Wars of the Holy Places, at p. 314. See the Israeli newspapers of July 25, 2017. The judgment has been published on websites. This judgment considered a petition against the alleged failure of the police to deal with the violent behavior of Waqf officials towards Jewish visitors on the Temple Mount. The petition was dismissed after it was proved that the police were in fact operating properly against Waqf members and properly safeguarding the Jewish visitors to the Temple Mount and public order there. See: S. Schwebel, “What Weight to Conquest?” op.cit. p.346; Y. Blum, “The Missing Reversioner: Reflections on the Status of Judea and Samaria,” op. cit. at pp. 279-301, and his article “Zion in International Law,” p. 320. Arnon and Vinitzky, Land Law and International Law in Judea and Samaria, at p. 85. This right is regulated in Article 51 of the United Nations Charter. For a detailed discussion, see R. Sable and Y. Ronen, International Law, Third Edition, Jerusalem, 2016, at p. 336. For a thorough discussion of the issue in question, see, for example, the three articles on this subject in Arnon and Vinitzky’s book, Land Law and International Law in Judea and Samaria, above, and the committee report on the status of construction in Judea and Samaria (headed by Supreme Court Justice (ret.) E. Levy) of June 21, 2012, at 375-379 of this book. Collection of Laws and Regulations (Majmu’at al-Qawanin wa al-Anzimah), vol. I, at p. 4.
International Legal Materials (1982), p. 1637; Lapidoth and Hirsch, A Collection of Documents, at pp. 339-343. For a detailed discussion of these conditions, see Y. Dinstein, International Law and the State, Schocken and Tel Aviv University Press, 1971, at pp. 94-100. Pursuant to UN General Assembly Resolution 67/19 of November 29, 2012, to allow the Palestinian Authority to join the UN as “an Observer State which is not a full member,” the PA decided to call itself “the State of Palestine.” However, it does not meet the requirements of international law for recognition as a state, as stipulated in the Montevideo Convention on the Rights and Duties of States, 1933, as detailed in Prof. Dinstein’s aforementioned book. For this purpose see also: G. R. Watson, The Oslo Accords – International Law and the Israeli-Palestinian Peace Agreements, Oxford University Press, Oxford, 2000, at pp. 68, 250. This question was discussed in Israeli law, for the first time, within the framework of the procedural decision of March 30, 2003 of the Jerusalem District Court. In Civil File 2538/00 Litvak v. The Palestinian Authority and Yasser Arafat, in a number of common procedural questions relating to a number of tort claims pending against the Palestinian Authority; see Piskei Din Mechoziim 2002(b) 776. The opinion of the two majority judges was that the question of the status of the Palestinian Authority as a state is a political-legal question that should be decided in each claim separately, based on a certificate of the Minister of Foreign Affairs on this matter. The minority judge, Justice M. Drori, held that the question under discussion was a legal matter only, which only the court was authorized to hear, and there was no need for a certificate from the Foreign Minister on the subject. Accordingly, he considered in detail the status of the Palestinian Authority and held that it was not a state. Although the Palestinian Authority filed an application to appeal to the Supreme Court against the decision of the District Court (ALA 4060/03 PA v. A. Dayan), it did not contest the District Court’s ruling on the above question, and therefore, the Supreme Court did not reexamine it, and it became final and binding (see ibid., Para. 7 of the judgment). The rest of the application was also rejected. The judgment was published on the Supreme Court’s Judgments website and in 62(3) PD 1. See also: CA 5093/06 Agudat Midreshet Eretz Israel Association v. The State of Israel, (the judgment was published in the Supreme Court website). Accordingly, the District Court of Jerusalem (per Deputy President, Justice M. Drori) ruled in another case, based on an appropriate certificate from the Minister of Foreign Affairs, that the PA is not a state. See: Civil File (Jerusalem District Court) 4071/02 Anon. v. The PA, paras. 18, 38, 539-540 of the decision of 15.10.12 (published in the databases); see also: Civil File (Jerusalem District Court) 3361/09 Heirs of Sharon Ben Shalom v. PA (published in the databases). Therefore, the case law states that the immunity of a foreign sovereign will be granted only to entities recognized as states by the Ministry of Foreign Affairs. See also: HCJ 4354/92 Temple Mount Faithful v. Prime Minister, 47(1) PD 34, 37; HCJ 910/86 Ressler v. Minister of Defense 42(2) PD 441, at 523-524; HCJ 186/65 Rainer Prime Minister 19(2) PD 485,487. See mainly: HCJ 223/67 Ben-Dov v. Minister of Religious Affairs, 22(1) PD 440, 441–442 opposite the letters A-B; HCJ 171/68 Hanzalis v. Tribunal of the Greek Orthodox Church, 23(1) PD 260, 269; HCJ 283/69 Ravidi v. The Military Court, 24(2) PD 419; 422-423; HCJ 282/88 Awad v. Yitzhak Shamir, Prime Minister, 42(2) PD 424, 429; HCJ 4185/90 Temple Mount Faithful v. Attorney General 47(5) PD 221, 280-282; Statement by the Minister of Justice Shapira during the Knesset debate on the bill pursuant to which Israeli law was applied to east Jerusalem, Records of the Knesset, vol. 49, at p. 2420. HCJ 256/01 Rabach et al. v. The Jerusalem Court for Local Matters, 56(2) PD 930, 934 opposite the letter F, and at p. 935 opposite the letters A-C. Id., at p. 934 opposite the letter F; and at p. 935 opposite the letters A–C. S.H. 5758, at p. 180. Official Gazette, No. 1390, at p. 2159. LSI, vol. A, at p. 24. S.H. 5738 – 1978 at p. 76. See also Sections 49(b) and 28(a) of this Law. Israel joined the Convention and its signature took effect on January 6, 2000. For the text of the Convention, see Treaties No. 1303, vol. 44 at p. 1. For the discussion and decision see: WH Committee 1st Extraordinary Session, Paris 1981, cc-81 / conf. 008/2 Rev. Paris, (September 30, 1981) at pp. 1- 4; 113Ex / Dec.5.5.1 (19.10.1981). This is an international, non-governmental body that advises the World Heritage Committee, in accordance with Article 8.3 of the above-mentioned Convention. For recommendations, see Records of the General Conference, 17th Session, Paris 17.10- 21.10 (1972), vol.1: Resolutions, Recommendations, at p. 135. I again thank Prof. M. Turner, Chairman of the Israeli Committee for World Heritage and the Archive Director of the Ministry of Foreign Affairs, Ms. Ortal Elbaz-Bracha, for having provided me with the list of these sites. The Ramban Synagogue, the Yohanan Ben-Zakkai Synagogue, the Prophet Elijah Synagogue, and the Istanbul Synagogue; see also: WH Committee: 1st Extraordinary Session, Paris 1981, 148 Rev., Addendum to Annex III (16.12.1980). According to Christian tradition, this was the place where the Roman prefect Pontius Pilate presented Jesus to the Jews. See: The New Testament, Book of John 19: 5. For more details see: Schiller, Guide to Christian Sites in Israel, at pp. 197-198. For the discussion and decision see: WH Committee: Report of the 6th Session, Paris, 1982 sec.x. at pp.7-8; 82/ch/conf.015/8 Paris (17.1.83). For further details, see Berkowitz, Wars of the Holy Places, at pp. 68-70, 124-125. Dore Gold, The Campaign for Jerusalem, Yediot Ahronoth Press, Tel Aviv, 2008, at 122.